The Pomegranate bush is very beautiful. From the moment the first blossom appears to the time the fruit is fully riped and has its skin cracked and its ruby red seeds show is an amazingly beautiful process. In Iran the pomegranate thrives in the hot and dry air of the foothills surrounding the central Iranian dessert, so finding such a fruit in that climate was nothing short of a miracle to the ancient Iranians. In fact, It is said that Cyrus the Great, the 6th century BC ruler of the Persian empire, had wished for as many good generals in his army as the number of seeds in a pomegranate. Last year, when some "opportunistic" individuals decided to pick our pomegranates from our front yard and enjoy it on their own Mr. Dad was furious, but then he prepared himself for the following year. This year he had fenced up the precious tree and has counted every single pomegranate and examined them for readiness every day. 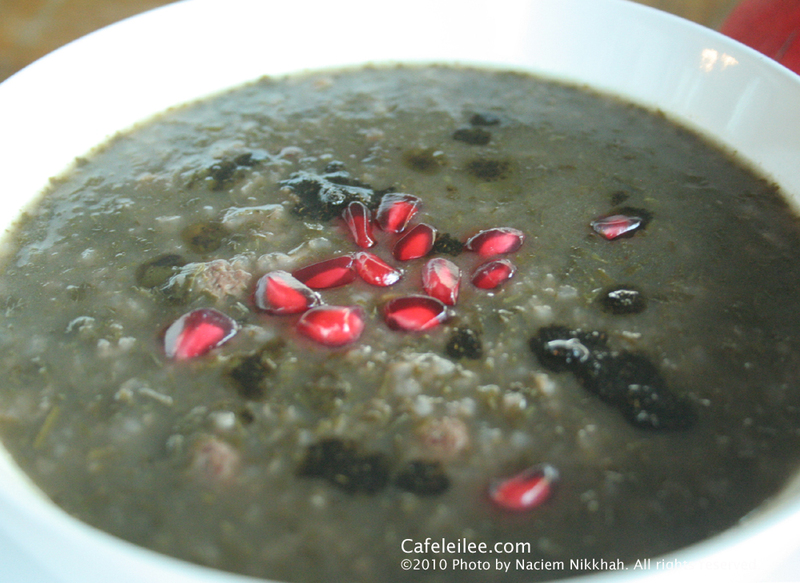 So, with all the pomegranates that did not get stolen this year, I decided to make this delicious pomegranate soup. I juiced about 3 cups worth of pomegranates (from about 4 pounds of pomegranates) thinking that it was enough, but after I added the juice, I felt that the soup needed more pomegranate taste, so I added some pomegranate paste instead of juicing more pomegranates. Also to make the recipe vegan and vegetarian friendly you can just opt out the meatballs. Clean and wash the herbs, remove any hard stems, dry and chop finely. Combine the ground beef with grated onion and salt and pepper and make tiny meatballs (approximately 2/3 of an inch in diameter). Wash the rice and split peas. Fry the sliced onion in the oil until golden, then stir in the drained rice and peas. Add about 2 quarts of water, cover and simmer for about 30 minutes. Gently add the meatballs, and let them cook for 15 minutes. Add the chopped herbs and simmer for about 30 more minutes, stirring from time to time. Stir in the Pomegranate juice and paste, and let it simmer for 10 more minutes. Adjust the seasoning if necessary. To make the garnish, heat the oil in a small pan. Remove from the heat and add the dried mint, and stir. 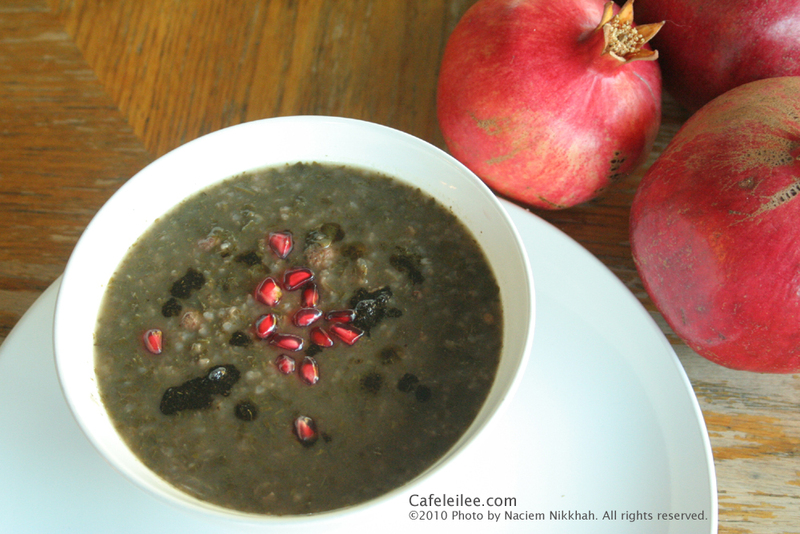 To serve, dish up the soup into a bowl, and garnish with swirls of fried mint and pomegranate seeds. انار جزو محبوبترین میوه های ایران هست. گفته میشه که کورش کبیر همیشه آرزو داشت که به اندازه دونه های یک انار ژنرال های خوب تو ارتش داشته باشه. حالا تجسم کنید که آقای پدر چه احساسی بهش دست داد وقتی یک سری آدم فرصت طلب پارسال انارهای جلو خونه رو برای خودشون چیدن و هیچی بجز یک انار ریز برای ما نگذاشتند. امسال آقای پدر کاملا آماده بود که از زحمات یک سالش نگهداری کنه. دور درخت انار یک حصار جانانه کشید و از روزی که اولین انار رو روی درخت دید شروع کرد به چک کردن انار ها تا مطمئن بشه که تا یکیشون آماده بود اون رو قبل از سارقان بچینه. این آش انار هم در واقع به خاطر فراوانی محصولات این درخت به همراه درخت پشت حیاط هست پختم. اولش حدود ۷ تا انار را آب گرفتم که وقتی به آش اضافه کردم به نظر کم اومد و برای همین کامی رب انار هم اضافه کردم. سبزی ها را تمیز کنید، بشوید و خرد کنید. گوشت چرخ کرده را با پیاز رنده شده و نمک و فلفل مخلوط کنید و کوفته ریزه درست کنید. برنج و لپه را خوب بشوید. پیاز خلال شده را با روغن سرخ کنید. برنج و لپه را اضافه کنید و حدود ۲ لیتر آب اضافه کنید. بگذارید لپه و برنج برای حدود نیم ساعت بپزد. کوفته ریزه ها را اضافه کنید و بگذارید برای ۱۵ دقیقه بپزند. سبزی را اضافه کنید و بگذارید آش برای نیم ساعت دیگر بپزد. هر از چند گاهی آش را هم بزنید. آب انار و رب انار را اضافه کنید و بگذارید آش ۱۰ دقیقه دیگر بجوشد. در این مدت با یک قاشق نعناع خشک و ۲-۳ قاشق غذاخوری روغن نعناع داغ درست کنید. برای سرو کردن آش، آش را در یک کاسه بریزید و آن را با نعناع داغ و دانه انار تزیین کنید. I love Ash-e Anar and your ash looks so delicious! I'm glad I found your blog!